Our next talk is this Sunday, 26 October and the speaker is Derek Janes. 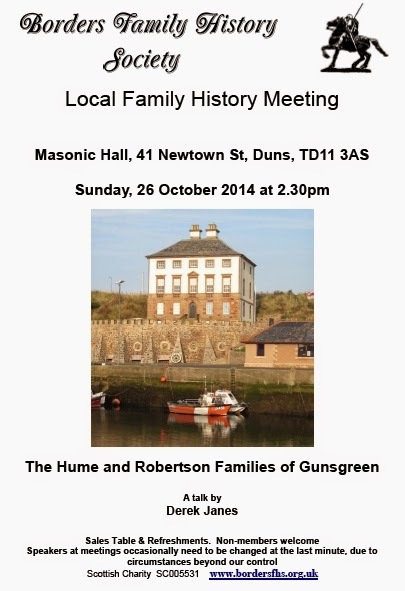 It takes place at the Masonic Hall, 41 Newtown St, Duns, TD11 3AS. Map. Gunsgreen House in Eyemouth, Berwickshire, was built in the 1750s by a smuggler, John Nisbet. In 1787 he was made bankrupt by the well established merchants, Robert Robertson and Son. After a two year struggle, Gunsgreen House was sold and purchased by Robert’s son Alexander. Thus began a 90 year association with the Robertsons and their close relations, the Homes. Derek’s talk will cover the story of the two families, including Alexander’s daughter Mary, the grandmother of Field Marshal Douglas Haig; her brother, Robert junior, who had an affair with the famous French writer, Madame de Stael; his son Robert, a university friend of Tennyson; and Margaret Hay Home who, although described as “a little dotty”, was a friend of General Booth, the founder of the Salvation Army, who once stayed at the House. Derek will also demonstrate how the resources of family history research can aid the academic historian in his/her work. I think you'll find this a very interesting talk whether you're interested in Eyemouth, family history, the Humes, Homes, Robertsons or smuggling. The Church of Jesus Christ of Latter-Day Saints, who most of us know and refer to as "the Mormons", are running a free family history day from 9am to 4pm on 15 November 2014 at 30A Colinton Road, Edinburgh. Registration starts at 9am and orientation at 9.30 am. 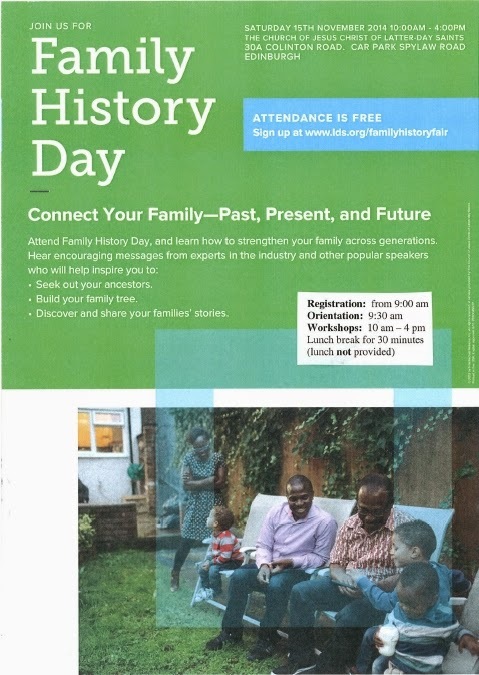 Registration for the Edinburgh Family History Day is essential, which is followed by 2 subsequent emails. There will be a lunch break but you have to provide your own. The car park entrance is in Spylaw Road. If the date or location isn't convenient, there are fairs in other towns and cities and dates planned - search for your family history day location. The Probate Service for England and Wales have launched a new index to wills of soldiers who died while serving in the British armed forces between 1850 and 1986. You need to enter at least a surname and year of death but you can add additional data in the advanced search. It's a pity that it doesn't allow a range of years to be entered but you can page backwards or forwards to see other years. Note however that if the soldier for whom you're searching didn't leave a will or wasn't serving at the time, you won't find them. However, I think I've found a problem either with the search mechanism or in the index of soldiers in their database. My info is that Leonard Cyril Munns died 10 June 1944 in France. The details for Leonard Cyril Munns are on the Royal Leicestershire Regiment Online Archive but I also checked on the Commonwealth War Graves Commission website. I've queried this anomaly with the Probate Service for England and Wales. 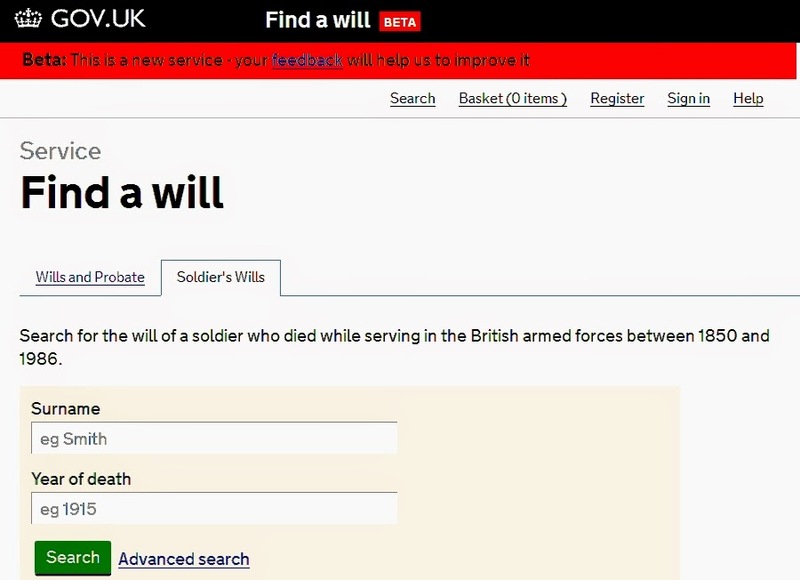 Search the wills of British soldiers index. 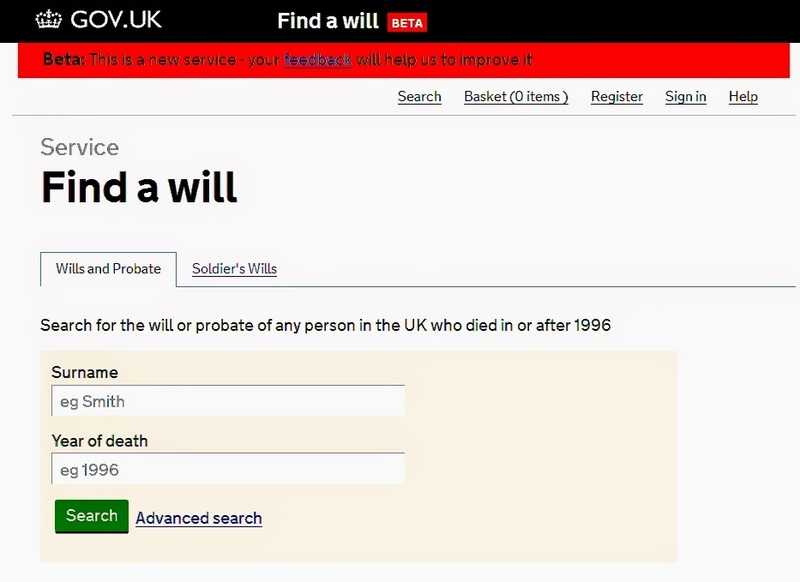 There seems to be a problem with this link and for the moment you'll need to click on the Soldier's Wills tab. Once you've found the person you want you can download the grant and or will for £10 per person. The Probate Service for England and Wales have launched a new index to wills of people who died in England or Wales after 1995. The website currently says "Search for the will or probate of any person in the UK who died in or after 1996" but I've been in contact with Stuart Marshall to point out that it should say England and Wales (instead of UK) and he says he will get this amended. I imagine the person creating the website saw the referendum poll results and assumed that there would be such a victory by the 'Yes' campaign that Scotland would be independent after 18 September. Search the England and Wales Will index.